The poetry of Wilfred Owen has gradually established itself as some of the most important in all of English Literature, not without good reason. The subject matter, the horrors of the 1st. World War, the draft of hundreds of thousands of largely ignorant but patriotic young men, the blood sacrifice for country and his ultimate rejection of this idea as a ‘noble’ cause. His poetry can be hard hitting stuff, read ‘Dulce et Decorum Est’ or ‘Spring Offensive’ and you are right there, falling off the end of the world, your blood caught by the open buttercups that grew on the field of battle. Wilfred Owen said, ‘My subject is war and the pity of war’, I have no love of war but I do feel great empathy with all those young men who were needlessly slaughtered, I also realise that but for the accident of my birth, I could have been there! I’ve known this poetry for ever and it has stayed with me, I had to paint how it makes me feel. 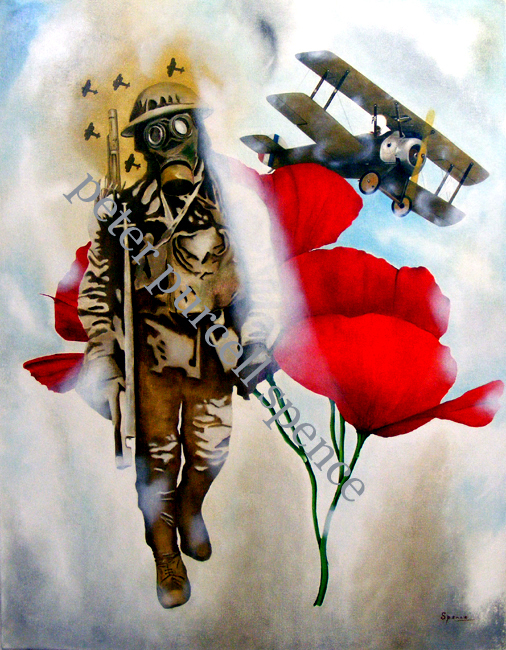 ‘Remembering Wilfred Owen’ is the first in a series of three paintings based on his poetry.